This is one of our favorites. We both thought it was one of our better ones, but then something happened to me and it helped confirm it. I was sitting in my Fiction class at Weber State and our comic was being printing in Weber State's newspaper at the time. I hadn't had a chance to check out our comic that day, but then I heard another kid in my class start laughing while he read the paper. Then he handed the paper to his friend while he was laughing and said, "This is hilarious. Check this out. That's totally happened to me!" When I saw it was our comic, my insides started to burn with well-deserved and genuine emotion. I teared up a little bit when I called John and told him the story. I had actually witnessed a positive, completely candid reaction to our comic. We both sat back and envisioned all of the other reactions that had taken place that we just weren't lucky enough to witness. As with many of our comics, the "real Alan" and the "comic Alan", are completely different. The "real Alan" was a debonair ladies man who always had one or two girls on his arm. The "comic Alan" however as displayed in this comic has a little trouble with women, which we delve into further in future comics. This strip also marks the first time Cameron has a symbol on his shirt. John has had the "pez shield" in honor of a t-shirt Cameron gave John back on their mission. (which he still has and wears) We deliberated for a while on what symbol we should use. We wanted something equally sentimental. We ended up choosing an abstract symbol from a video game that we would play late into the night while our wives slept. Seriously we spent hours playing this game together. You don't get to see the symbol to well in this comic, but it is it's debut. I thought this one was genius, but I don't think very many people "got" it. I'll explain it, even though I really don't want to. We didn't realize how much we played the Playstation until it broke. There. That wasn't hard, right? By the way, Alan doesn't have 4 mouths in this comic... those are his chubby lips. After drawing several comics we thought, or I thought rather since I was doing the drawing, that we should do a set drawing that we could just import our jokes into. This is that drawing, it is simple and upfront, and all we need do is insert some dialogue. This was our first such comic, and unlike all of our other comics the drawing was done before the joke was written. We have mixed feelings about this one, I think both of us feel like the comedy is a bit forced. Either way, if there ever were a week where Cam and I didn't have time or any good jokes to do a totally original comic, we could just do one of these. We are funny enough to just make something up off the cuff. The dig at Adams father may come off a little underhanded. You should know however that this was kind of an inside joke between me, Adam, and Cameron. We would go on group dates and we thought it was so funny to tease Adam for losing his Dad, he was in on the whole thing of course. The girls faces and reactions were priceless. Adam will be the first to tell you about the copius pitty make-outs he got as a result. After reading these two comics about boogers being wiped under car seats, it would be easy for the casual reader to assume there were boogers wiped on virtually every surface of the House, seeing as though there were nine guys living there. Please don't assume this. That's really really gross. The truth is, we were all wise enough to only wipe our boogers on the FLOOR. This ensured they would dry quickly and be vacuumed up by Adam when he did the weekly house cleaning. I never wiped boogers under anyone else's seat (and neither did John... that I know of). That's the truth. But I DID stumble across boogers under my seat that didn't feel like they were mine as my hand brushed across them. This experiance actually happened, however in real life it was Abe Smith who was looking for money and being mocked. Abe was another member of the house with which the experiances most all of our comics are based on. In order to keep the comic from getting too confusing we just gave this situation to Adams character. All 4 of our main characters have a little bit of some of the myriad of other guys who lived in that house's situations and characteristics in them. Okay, so the whole "Adam is gay" thing might be getting a little old. I think after this comic was published at a university in Washington we were accused of being "Homophobic bigots". Cameron and I have always enjoyed that criticism. Truth is, this particular strip focus more so on "pretty boys" than sexual preference. We always marveled at the vast amount of time, money and effort some of our roommates spent on their clothing. Maybe Cameron and I are just both badly dressed. Either way we saw it as an opportunity for mockery. We never owned a Ouija board while living at the House of Nine (in fact, I'm pretty sure we had to edit this comic several times before we were even able to spell "wee-jee" the right way), but for some reason we thought it would be the epitome of hilariousness if we joked about how it wasn't just us mere mortals who thought Adam was gay, but the actual Prince of Darkness also might have had a sneaking suspicion about Adam's sexual tendencies. We also tried to have our characters be slightly more "animated" in this comic, which was difficult to do. I think we pulled it off pretty well, though. Stop pretending that this doesn't happen. I'll buy it that there are some girls out there who haven't wiped there boogs under the seat. I know a couple people have told us that they roll them between their forefinger and thumb and then flick them. Adam eats his I think, which is why his car was always free of "under the seat boogs". In any case, everyone picks their nose so if this comic doesn't present the real end result then it begs the question... What do you do with your boogers? This is one of Me and Cameron's favorite comics. Unfortunately Cameron's stupor in the middle two frames are all too real. Were I to actually be sitting and writing a letter in real life he would struggle to find something to explain the irregular behavior. This made it easy for us to transfer to comic format. Incidentally the bowling pin which sits in this comic for no apparent reason, was simply to pay homage to the actual bowling pin we received as a trophy when Cameron and I became the unlikely winners of a Dance competition at a Sandy bowling alley in 1999. This one doesn't pull any punches when it comes to making fun of Alan's weight. I actually think that this was the first comic that received letters of complaints at several colleges that Out of the Blue was running in at the time. There will eventually be a page on this website that is dedicated to the letters of compliment and complaint from students of various colleges. Then we began to discuss different worst case scenarios. What happens if we miss a deadline, or John breaks his right hand while diving for a wide shot while tending the goal during one of his soccer games? I suggested that if that were to ever happen, I would gladly take over the artistic side or our comic strip and John could still contribute to the creative process. John scoffed at the suggestion, but I was adamant that I could indeed, draw if need be. I mean, look at the crudity of the characters that John has created. I can draw Bart Simpson with vacant eyes just as well as the next guy. Well... I tried, and the last frame is straight from the end of my pencil. We've decided, since this comic was drawn, that it isn't as entertaining as we would have like it to have been. The idea was that if there was ever a day when John and I simply didn't feel funny and our ideas for comics were lame, we could just draw up a picture of some of the things that entertain us. This kind of backfired. The idea of our comic strip is to BE FUNNY. This conclusion is the exact opposite of the conclusion that we came to in the first frame of the strip. "Fun to read" isn't the same thing as "Funny to read". Let's just say that we learned a little bit about the process through the reactions to this particular comic. This is a sincere continuation of the conversation that John and I had while sitting on a couch discussing what on earth our comic would be about. Eventually there will be a page on this website which explains in great detail the environment that we lived in at the House of Nine. There were nine guys living in a small house in Salt Lake City. John and I figured that there were a plethora of comedic situations and conversations that we could base our comic strip on. We actually doubted whether we could create enough humor based on actual events, but we made it work. I know this comic looks like it should be a practice strip or something, but it's not. It is our actual first comic. This is based on a real experience. John and I were sitting around one day really discussing the possibility of trying a comic strip. John has some artistic talent, though it's not quite so evident in this strip, and our only option was for him to draw. John's excuse (and it's a good one) is that he's still getting a feel for the concept. We had to decide early on what we wanted our "signature" position to be. It ends up being the couch, but John is still trying to figure out how to draw it. Don't worry... it gets much better. 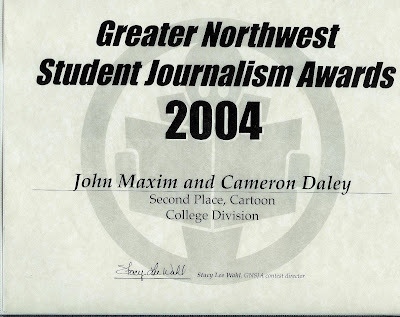 I know this looks like something John and I created on our own computer, but it's actually an award we received for our comic while it was being printed in several college newspapers. I mean, think about it. If John and I were to make it up, don't you think we'd have given ourselves "First Place"? Unless you think we're smart enough to give ourselves 2nd place just so it seemed more believeable. We didn't though... I promise.